Each image in the interview is linked to a larger version. All you need to do is click on the image to see the larger image. PC: You studied geology when you were at Vassar--how did you come to major in that? How did you get from geology to painting? MM: I loved the outdoor work, the maps and all the gorgeous landscape photographs in the geology text book. By the time I realized I wasn't so keen on the science part of it I had completed all the course requirements for the degree, except the thesis, so I opted to stick with it, and get my degree. That same summer I took a figure-painting workshop and realized I wanted to pursue a career in art. PC: You've mentioned a life-long interest in baseball. You grew up in Lincoln, Massachusetts. Am I correct that your first love was the Red Sox? How long did you live in Philadelphia, before you developed an interest in the Phillies? MM: My Dad is from St. Louis and I used to spend part of every summer there. That is a great baseball town, maybe the best. The first games I went to were there. I got my love of the game from him. Since we lived outside of Boston I become a Red Sox rooter and in 1967 was devastated when my Dad rooted for the Cardinals over the Sox in the World Series. 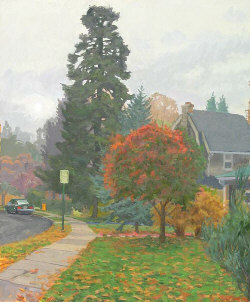 I moved to Philadelphia in 1981 to study with Neil Welliver at The University of Pennsylvania. The first time I realized I was more Phillies than Red Sox was around 1996 when inter-league play began. I was in Boston for the first game between the Red Sox and the Phils since the 1916 World Series. Scott Rolen, who was a rookie at the time, made a terrific diving stop to start a late game rally killing double play and I leapt up and shouted, ”Yeah!” I was the only one and felt the angry eyes of every one around me. I hadn't realized till then, but it was clear, I had crossed over. Of course I was on board the Sox train in '04 when they came back against the Yankees and then swept the Cards. PC: Before you started painting images from baseball did you go to a lot of games? Or did you listen on the radio or watch on TV? Did watching/ listening influence what you include? How did this influence the way you see the images before you make your paintings? MM: I've always gone to a lot of games. In fact I've always found it hard to watch on T.V. because of the compression of space. The game is all about space, lots of it, and the tube makes everything seem close together. 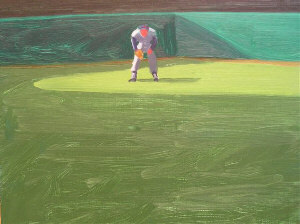 I'd say the biggest influence on my paintings were the images I saw on baseball cards, where the photo's were often from below, giving the figures a monumental look. 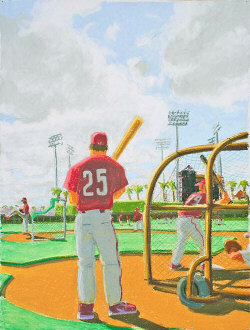 PC: When did you start doing baseball paintings at University of Pennsylvania? Do you remember the first one? MM: The first baseball painting I did at Penn was from memory of a game at Baltimore's Memorial Stadium. It was of a fielder in center field, the Red Sox's Rick Miller in fact. Neil Welliver walked into my studio, took one look at it and said, “I like the psychology of that.” It was by far the most positive thing he had ever said about my work. And it was unambiguous. PC: So you did the first...and then what? What impelled you to return to it as a subject? MM: I did a larger version of the first baseball painting, showed it in the school gallery, and a renowned Psychology professor bought it and wanted to meet me. (Prof. Phillip Rieff) This was very affirming. PC: Have these paintings changed over the years? How? MM: The first ones were more from my imagination, archetypal. The recent work is mostly based on my own experience, but with the space and figures maneuvered around to create a dynamic visual experience that combines multiple views with several sources into one consistent image, not unlike those big cyclorama paintings of the civil war. I love those. PC: What's the role of photography in your baseball paintings? In “The Stage is Set” for example, a choice of lens? In landscapes? MM: Photography is an amazing resource but a painting that looks like a photograph is a bore. The trick is to use the information provided by the photograph without copying the photograph. I especially love posed publicity shots. They have a whole overlay of pop art sensibility about them. The Stage is Set is based on many photographs and sketches I made from the site. 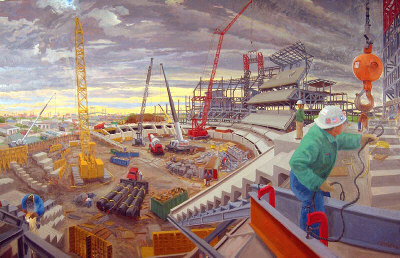 I had done a series of oil studies of the stadium construction from that spot and did a large canvas, Ballpark Construction, Philadelphia based on the sketches. It seemed natural to do a picture of the completed painting from the same spot. PC: Would you talk about the impossible reflections in the woman's eyeglasses? MM: I saw that as an opportunity to include much that was out of the view frame of the painting into the painting. Sort of like the shadow of a mountain on a copse of trees. You see the trees, the sky behind them, and the shadow tells you about the mountain behind you, the viewer. Again, it's an attempt to make the painting a more alive, dynamic experience. MM: This one sums up much of what I've been talking about. The two guys are friends, one a Yankee fan, the other a Red sox fan. They were both architects for the new Phillies stadium. I used a photo of them for a reference because it seemed to sum up the emotion of the Red Sox come from behind victory over the Yankees in '04. Many of my closest friends are Yankee fans. We are joined at the hip. So their arms are around each other, reacting in opposite fashion to the crushing blow of Johnny Damon's grand slam homerun in game 7 of the '04 A L Championship Series. 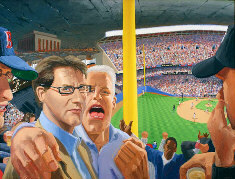 The view is based on photos I made from out seats in Yankee Stadium during game two of the same Series, a Red Sox loss. My friend (he is visible on the far left) and I were viciously heckled after the game, so it was with great glee that I brought to life the N Y Daily News headline after the Sox won, Hell Freezes Over Ha haha!!!!!!!!!! PC: You studied with Neil Welliver at the University of Pennsylvania. What did you learn from him that moved your painting from one place to another?